Petra, one of the seven wonders of the New World is a historical and archaeological city in Jordon, unbeknown and hidden from the world, until Johann Ludwig Burckhardt introduced this magical city in 1812 and since then Petra has become a symbol of Jordan and the countries most visited tourist attraction. It was designated a UNESCO world heritage site in 1985. The city of Petra, also known as the rock-carved rose red city, is most famous for “The Treasury”. If you are an 80’s child, you’ll probably associate Petra with Indiana Jones – The Last Crusade. 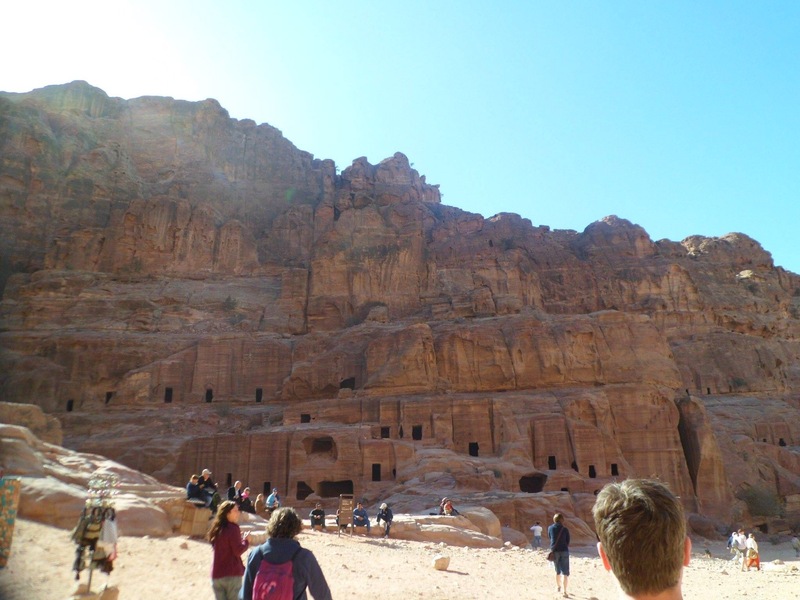 This was certainly my first encounter of the existence of the ancient city of Petra and since then I have longed to visit Petra. No matter how many times you have seen images of Petra, nothing quite prepares you for what you are about to experience. If there is one place in the world you must visit, make Petra top of your list. Petra is easily accessible from the Capital Amman with British Airways flying direct to Amman from London Heathrow daily. 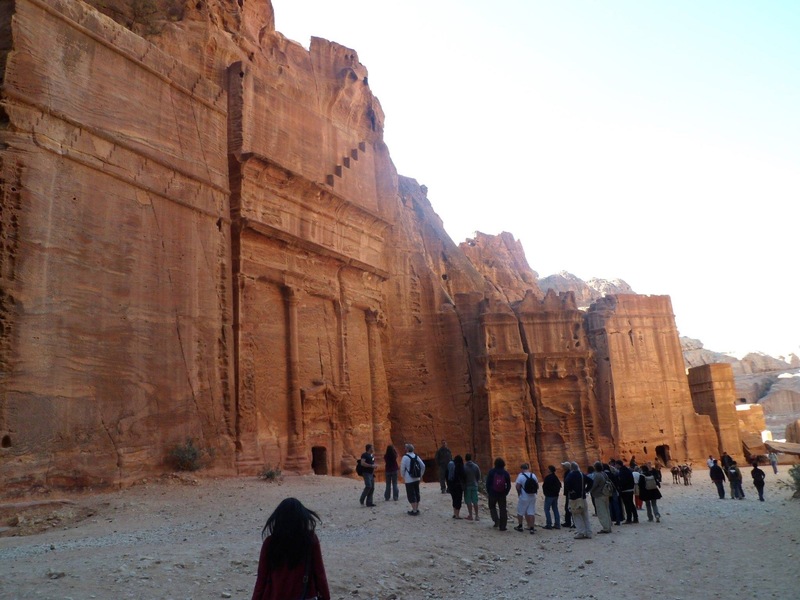 If you are already in Jordan, Petra is accessible via other major cities. What you may not be aware of is that you can also visit Petra via Egypt with tour agencies offering regular day excursions from Sharm El Sheikh, which is the route we took. Since many of us vacation in Sharm El Sheikh year round, this is a great alternative route to see everything you want to on the day excursion from Sharm El Sheikh. However, if you want to visit Amman, Wadi Rum and the desert, you might want to consider extending your stay and visiting with a tour agency as getting there by yourself isn’t easy unless you have your own car and know your way around. 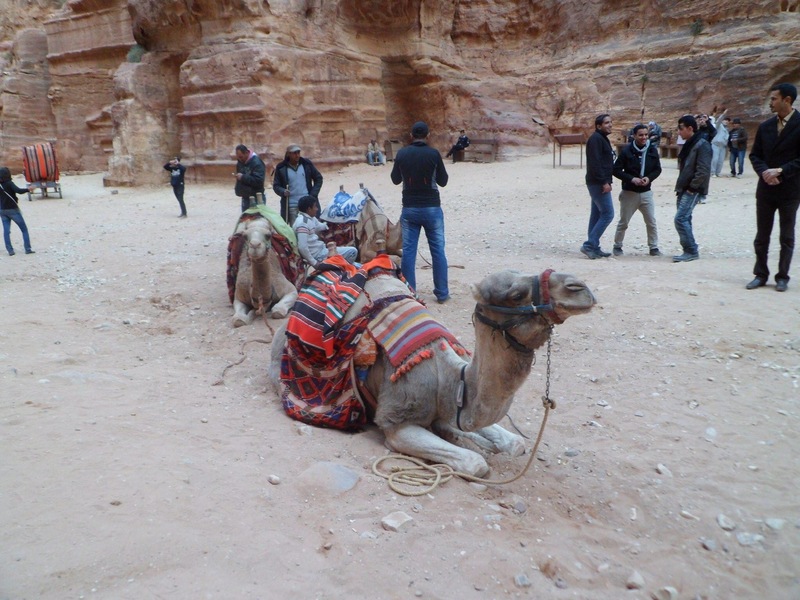 For a one day excursion via Sharm El Sheikh, you’ll get a feel for Jordan and Petra’s main sites. Most tour agencies in Egypt offer day excursions so finding the right one for you will be easy and you can also negotiate the price. One adult ticket will cost approximately £150 with lunch and entrance tickets included, which is well worth the price, considering you are not only ticking off one of the seven wonders of the new world but also another country. Return to hotel – Approx. 10pm. When you arrive at Petra, your first stop is at the tourist centre where you are then led to the entrance of the “Siq”, which is a split rock, encompassing a mesmerizingly 2 mile long burnt orange rock canyon that gradually unfolds to reveal the opening of a magnificent concealment – “The Treasury”. 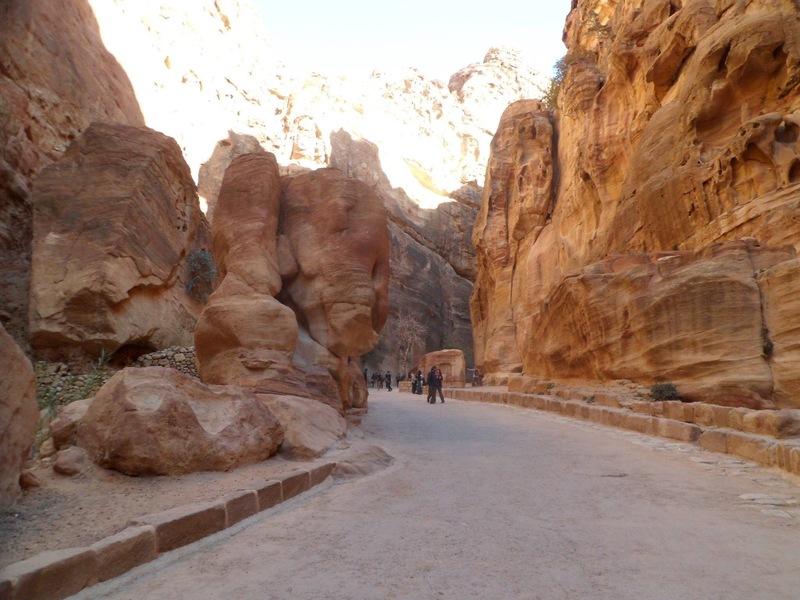 As you walk along the mystical narrow and rock filled pathway of the canyon, a route shared with camels, horses and bedouin riders, you are in a constant battle of waiting in anticipation for the opening to appear but also longing for the walk to never end. The stunning walk through the canyon in itself is an amazing experience, yet the gradual appearance of “The Treasury” is quite simply the icing on the cake. If there is ever a time you feel like you have been transported to a mystical ancient era, the walk through the canyon will achieve just that. Once you reach “The Treasury” it is everything you imagine it to be and so much more. Its beauty is breath-taking that no words can describe all the emotions that run through you – to see it is to believe it. Beyond “The Treasury”, there are various other archaeological sites of interest, equally impressive and magnificent – it is almost hard to believe these sites are all man-made. For us the absolute highlight was the walk through the Siq and seeing the first glimpse of “The Treasury”. We visited early December when the weather was a comfortable 20degrees and also relatively quieter compared to the peak summer period. Visiting between late September to December would be ideal. We would recommend avoiding the hot summer period when temperature can reach over 40degrees – the journey to Petra in the heat combined with the extensive walking and lack of places serving cold drinks will make the trip uncomfortable and take away from the magic. We would also highly recommend, if you are not visiting with a tour group, you get there in time to watch the sunset. Take your passports as you will have to go through passport control at the Egypt-Jordanian border. Wear comfortable shoes – you will be doing a lot of walking. If you are visiting via Sharm El Sheikh, ask your hotel for a breakfast bag, you’ll need this for the long journey to Petra. Get as much sleep as you can on your route to Petra, you’ll need all the energy you have for the vast amount of walking you’ll be doing. Take all your holiday essentials – camera, sunglasses, sun hat etc. Be sure to use the rest rooms on the ferry or at the tourist centre as limited toilet facilities are available elsewhere. If you do get tired, horses, camels and donkeys are available to ride on at an extra cost, but we would highly recommend you walk through the Siq – it is absolutely magical. Families with young children, infants or strollers. If you are visiting Jordan with a tour group, lunch at one of the local restaurants in the city centre is included with the package. We had a fulfilling buffet lunch consisting of traditional Jordanian food and the best part is everything is halal! Petra is a magical city that one must visit in their life-time and once you have been you’ll be longing to return time and time again. How may places in the world make you feel like that? The day excursion from Sharm El Sheikh gives you the opportunity to visit the main attractions, and although it may not seem long enough, trust us when we say you won’t be disappointed!